PEMBA, Zambia, Nov 7 2017 (IPS) - As governments gather in Bonn, Germany for the next two weeks to hammer out a blueprint for implementation of the global climate change treaty signed in Paris in 2015, a major focus will be on emissions reductions to keep the global average temperature increase to well below 2°C by 2020. While achieving this goal requires serious mitigation ambitions, developing country parties such as Zambia have also been emphasising adaptation as enshrined in Article 2 (b) of the Paris Agreement: Increasing the ability to adapt to the adverse impacts of climate change and foster climate resilience and low greenhouse gas emissions development, in a manner that does not threaten food production. The bad season that farmer Malambo refers to was characterized by El Nino, which affected agricultural production for most African countries, especially in the Southern African region, leaving millions of people without food. But as the case was with farmer Malambo, CA farmers thrived amidst these tough conditions as the CASU project discovered in its snap assessment. “CA has proved to be more profitable than conventional agriculture”, says Precious Nkandu Chitembwe, FAO Country Communications Officer. “In seasons when other farmers have struggled, we have seen our CA farmers emerging with excellent results”, she adds, pointing out that the promotion of legumes and a ready market has improved household nutrition and income security for the farmers involved in CA. “I am particularly happy with the introduction of easy to grow cash crops such as cowpeas and soybeans which are not only money spinners but also nutritious for my family—see how healthy this boy is from soya-porridge,” says Malambo pointing at his eight-year-old grandchild. While Zambia boasts a stable food security position since the introduction of government farmer input subsidies in early 2000s, the country’s record on nutrition leaves much to be desired. Hence, the recent ranking of the country in the top ten hungriest countries in the world on the Global Hunger Index (GHI) may not come as a surprise, as the most recent Zambia Demographic and Health survey shows that 40 per cent of children are stunted. The GHI, now in its 12th year, ranks countries based on four key indicators—undernourishment, child mortality, child wasting and child stunting. According to the International Food Policy Research Institute, of the countries for which scores could be calculated, the top 10 countries with the highest level of hunger are Central African Republic, Chad, Sierra Leone, Madagascar, Zambia, Yemen, Sudan, Liberia, Niger and Timor-Leste. “The results of this year’s Global Hunger Index show that we cannot waiver in our resolve to reach the UN Sustainable Development Goal of zero hunger by 2030,” says Shenggen Fan, director general of IFPRI, adding that progress made since 2000 is threatened, emphasising the need to establish resilience for communities at risk of disruption to their food systems from weather shocks or conflict. It is worth noting that Zambia has recognized the challenges of nutrition and has put in place several multi-sectoral measures such as the First 1000 Most Critical Days campaign—an integrated approach to address stunting by tackling both direct and indirect causes of under-nutrition. Unlike the standalone strategies of the past, the 1000 Most Critical Days campaign brings together all key Ministries and stakeholders of which the Ministry of Agriculture is a key stakeholder and entry point. “With a known high demand for good nutrition in the country, especially for rural populations, soybean and other food legumes offer an opportunity to meet this demand—from soybean comes soy milk which is as competitive as animal milk in terms of nutrition, use in the confectionary industry and other numerous value addition options at household level for nutritional diversity,” explains Turnbull Chama, Technical Assistant, Climate Change component at the FAO Country Office. While CA is a proven approach to climate resilience in agricultural production for food and nutrition security, its adoption has not been without hitches. 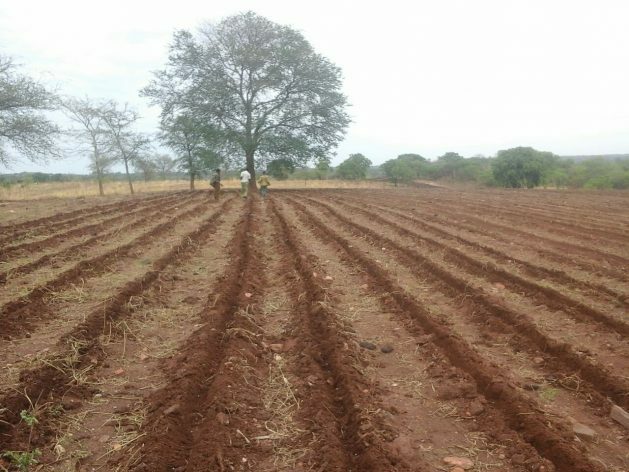 According to a study conducted by the Indaba Agricultural Policy Research Institute (IAPRI), adoption rates for Conservation Agriculture in Zambia are still very low. The study, which used data from the 2015 national representative rural household survey, found that only 8.8% of smallholder households adopted CA in the 2013/14 season. The report notes, however, that social factors, such as belief in witchcraft and prayer as enhancement of yields, were found to influence decision-making considerably. But for the Southern Province Principal Agricultural Officer in the Ministry of Agriculture, Paul Nyambe, CA adoption should not be measured in a generic manner. Agreeing with these sentiments, Douty Chibamba, a lecturer at the University of Zambia Department of Geography and Environmental studies, offers this advice. “It would be thus important for future policies and donor projects to allow flexibility in CA packaging because farmers make decisions to adopt or not based on individual components of CA and not CA as a package,” says Chibamba, who is also chairperson of the Advisory and Approvals committee of the Zambia Civil Society Environment Fund phase two, funded by the Finnish Embassy and managed by Panos Institute Southern Africa under its (CBNRM) forum. This year’s World Food Day was themed around investing in food security and rural development to change the future of migration—which has over the years been proved to be as a result of the former. And FAO Country Representative George Okechi stresses that his organization is committed to supporting Zambia in rural development and food security to reduce rural-urban drift. “With our expertise and experience, working closely with the Ministry of Agriculture, we continue providing policy support to ensure that farmers get desired services for rural development,” says Okechi. “We are also keen to help farmers cope with effects of climate change which make people make a move from rural areas to urban cities in search of opportunities,” he added, in apparent reference to Climate Smart Agriculture initiatives that FAO is implementing in Zambia, among which is CASU. Is CA a “proven approach to climate resilience in agricultural production for food and nutrition security”? If so will someone please publish/cite the evidence that shows that this is the case?